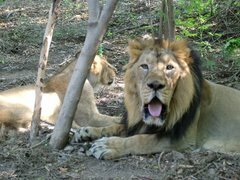 Kanpur: Lion cubs prepare for public appearanceTwo cubs of an Asiatic lioness Nandini in a Kanpur zoo were brought out on Friday, almost three months after they were born underweight. The cubs were kept under constant monitoring of the zoo veterinarians during the initial stages of their birth as they were critical. Kanpur: Lion cubs prepare for public appearance Two cubs of an Asiatic lioness Nandini in a Kanpur zoo were brought out on Friday, almost three months after they were born underweight. The cubs were kept under constant monitoring of the zoo veterinarians during the initial stages of their birth as they were critical..